There was a big lone Sorakkai crammed into our already bursting fridge and it was sitting there in that jam-packed vegetable basket for 4 days now with no hope of getting out. I saw it every-day and made a mental note to do something with it the next day but never got around to it what with the formula menus at home (like Sambar & potato thokku, kuzhambu & cabbage kootu). The 5th day I was asked to make breakfast because everyone else was busy. I could decide what to do! Yipee! This doesn’t happen often. I decided to rescue the Sorakkai from its stuffy station and style it into a chutney. I love these vegetable chutnies/pachadis but my husband doesn’t. Heck, you can’t please all of them all the time. I was going to make the Sorakai pachadi come what may. I had memorized the Sorakaya pachadi recipe on Sailusfood the previous night and I was prepared. The Chutney was a gorgeous medley of flavours – hot, tangy and sweet and it was great with idli. I can imagine this chutney making a really nice pair with dosai, pongal or upma as well. As expected, my husband didn’t like it but that’s because he doesn’t like chutnies in general; nothing wrong with this one. Earlier, I’d get easily offended if somebody didn’t like what I’d made but not anymore. I am now mature enough to recognize biases and correct my ratings accordingly. 1. Heat 1 tbsp of oil in a kadai and add all the ingredients other than sorakai and roast on low till a nice aroma emanates. Remove from fire and let cool. 2. Heat the remaining 1 tablespoon of oil and add the cubed sorakkai/bottlegourd and cook on high for 2-3 minutes. Then cook covered on medium-low till the sorakkai is soft and knife easily slides through a sorakkai piece – about 15 minutes. Remove from fire. Let cool. 3. Grind the spices first to a coarse paste adding a little bit of water. Then add the cooked sorakkai, tamarind, jaggery and salt and grind to a chutney consistency. Add a little water if necessary. 4. For the tempering, heat oil in the same kadai and when hot add the mustard seeds. When they splutter, add the cumin and curry leaves. Dump the ground chutney into the kadai and stir to mix well. Remove from fire. 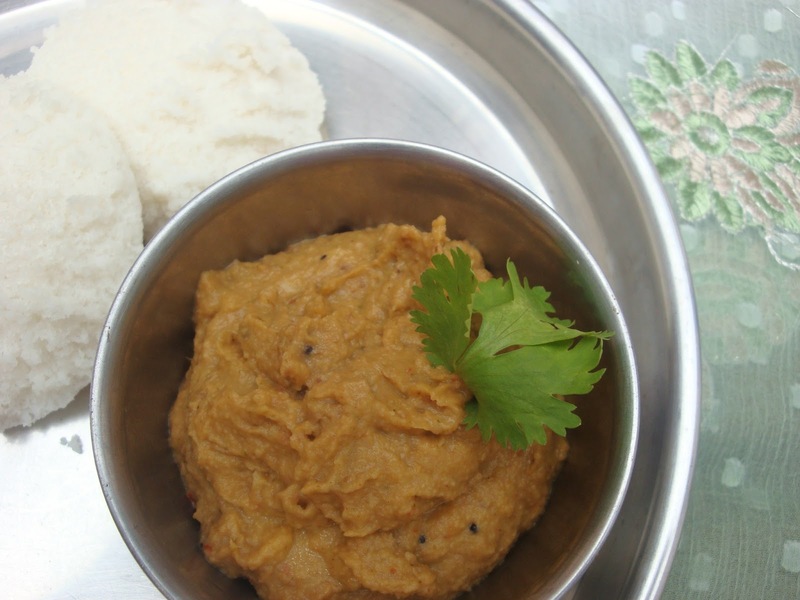 Serve with dosai, idli, pongal or upma. 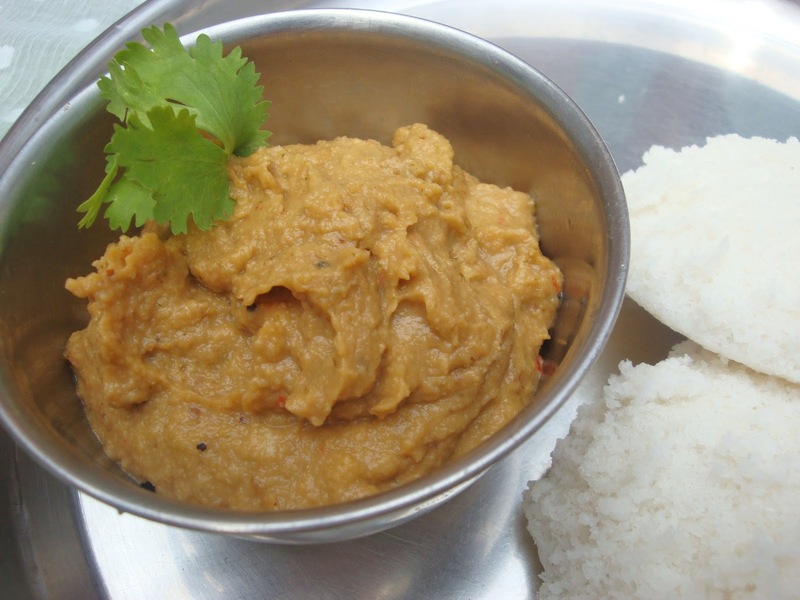 This entry was posted in Chutnies & Dips and tagged bottlegourd chutney, chutney, recipe, side dish with dosa, sorakaya chutney, sorakaya pachadi, Sorakkai chutney, sorakkai pachadi, vegetable chutney. Thank you for rescuing the lone sorakkai from my ref:-p this is a very healthy dish.